It just wasn't Paula Findlay's day. 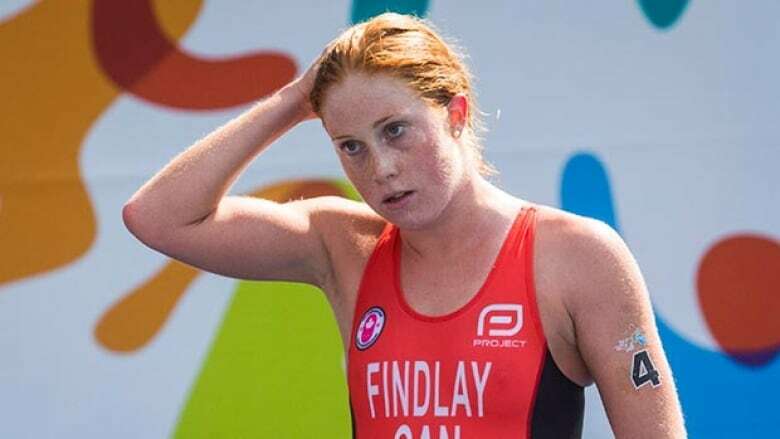 The Edmonton-born athlete finished a disappointing ninth in the triathlon at the Pan Am Games on Saturday. Paula Findlay lay under a shady tree, out of the heat of a Toronto lakefront morning, about 400 metres down from where the medals were being presented for the women's triathlon on this Day 1 of the Pan Am Games. Still covered with sweat, nose running from a cold, ice pack on her right knee and attended by a physio, the Edmonton native was recovering from finishing ninth in the swim-bike-run event, one she had been right in through the end of the 40 kilometres on two wheels. It was the final 10km on two legs that finished her hopes for a gold. "Oh man, I feel so sick," Findlay had said a few minutes before in the mix zone. "It's really disappointing. I came here to win, I'm not afraid to say that was my goal. "It was a pretty rough week leading into it, [I'd] been managing that all week, and I wasn't sure if I was going to be able to start." The victory went, as many expected, to Chilean Barbara Riveros, the top-ranked woman (currently fifth in world rankings), who crushed the field in the run portion to win by 29 seconds. Silver went to Paola Diaz, of the rapidly improving Mexican side, and bronze was around the neck of Bermuda's Flora Duffy. Calgary's Ellen Pennock, still coming back to form after breaking her collarbone last July, was a happy sixth. Joanna Brown, from tiny Carp, Ont., was 13th. To hear critics tell it, this year has been part of the Paula Findlay Redemption Tour that has an open-ended run to the Rio Olympic next summer. After dominating the ITU in 2011, she had come in to London 2012 with a hip injury and carrying a lot of criticism for the way she and her team had handled it. After finishing last, Findlay apologized to the country, perhaps helping to spur the meme that she now constantly carries. So many ifs pop up — if she could only win here, if she could just shed the ignominy of that day, if she could find a way to become what she once was — it was hardly surprising when the athlete basically said 'Yeah, but …'"
"But to 'redeem myself' from London, that's so silly. I do this ultimately for myself … and for Canada … [and] I think the support I get is fabulous, regardless of my result." The key is to qualify for Rio, something winning would have achieved. Now it's back to the ITU circuit for more work. "Next year [at the Olympics] is the biggest race for me," Findlay said. "This is not the biggest race of this year, even." There was a sense she was trying to convince herself of that, more than anyone else. By contrast, Pennock was thrilled with her performance and couldn't help but smile through the process of television, radio and ink-stained wretch interviews in the mix zone. "That was probably my best race so far this year," she said. "It's positive for me, and just having that home support I was actually smiling around some of the corners with people cheering for me and saying my name." The race itself began inauspiciously when the starter apparently forgot to say "to your marks" and instead merely sounded the horn. A number of coaches were annoyed by that afterwards. Riveros left the 1.5-km water course in the West Lock sitting eighth in a chase group that included the Canadians and Diaz. They would trail a breakaway pack until late in the bike leg when Riveros, one of the world's top triathlon runners, took over for a strong victory.